Happy Memorial Day Monday! Let's all be thankful for those who have served our country today. 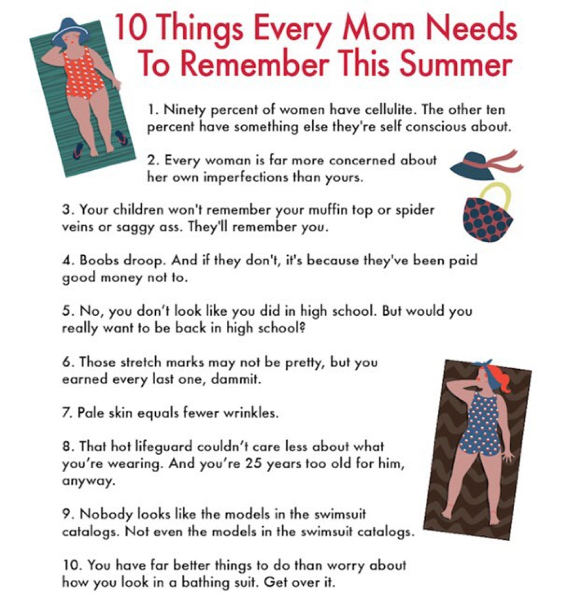 I stumbled across this little list, and thought it would great to share, whether you are a mom or not. With the unofficial start of Summer here, I know that this is something I need to read and remember. I have never enjoyed wearing a bathing suit since I had kids, and I know as women, we do far too much comparing to each other, and worrying about how we look. I want to print this list out and put it on my bathroom mirror (don't worry Josh, I won't) but I think for many of us, these are words we need to read every so often. You are all beautiful, no matter what you think, so rock that bathing suit ALL summer long ladies! Have a fabulous day, and remember, you do you!